At a time when energy costs for home heating/cooling are ever-increasing, any efforts that you, as a homeowner, can make to lower these expenses are worth consideration. Not only can more energy efficient options help you to stay cooler in the summer and warmer in the winter, but they can also help you to save a lot of money on your heating and cooling costs. Replacing older, low SEER-rated HVAC equipment with a new, high-efficiency unit is one popular tactic for lowering energy consumption and also improving indoor air comfort. Another, less-expensive alternative is to do some air sealing around your home, looking for places where air infiltration is robbing you of cool, conditioned air in summer and expensive, heated air in winter. Caulking, sealant, weather-stripping and insulation are all inexpensive ways of protecting yourself from energy losses caused by air leaks. One energy-conservation step that can make a huge difference, especially during warm weather, is the installation of a “cool” roof. Just like wearing light-colored clothing on a hot day will keep you cooler and more comfortable, a light-colored roof on your home will help keep it cooler and more comfortable during hot weather. 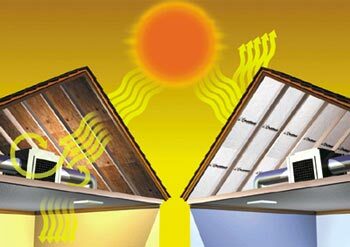 Besides the obvious comfort benefits, a cooler roof will also allow your air conditioning system to work less in keeping the indoor temperature at a desirable level, save energy dollars, extend the life-expectancy of your cooling equipment and reduce your home’s carbon footprint. What Exactly is a Cool Roof? Reflectivity – the amount of sunlight that is reflected (rather than absorbed) by a roof. Emissivity – the amount of time required for a roof to release absorbed heat. Savings on air conditioning and peak electricity demand costs. Extended roof life and fewer maintenance costs. Reduction of air pollution and smog formation. Less waste materials from roof replacement going into landfills. Roofs generally fall into one of two categories: low-sloped or steep-sloped. Low-sloped roofs are typically found on commercial and industrial buildings or on multi-family dwellings. The most practical method for making these roofs “cool” is to apply one of the many cool coatings available. These coatings, which come in liquid form with the consistency of a super-thick paint, can be applied over almost any surface, including gravel, metal and asphalt. Besides adding a reflective capability, additional benefits include added durability, retardation of algae growth and the ability for the surface to basically clean itself when it rains. As an alternative, reflective, prefabricated, single-ply membrane sheets may be glued or fastened to cover the roof surface. Sleep-sloped roofs, typically found on homes, commonly incorporate the use of painted metal or tiles to gain increased efficiency. While ordinary tiles made from clay or concrete may only reflect an average of 10-30 percent of the sun’s rays, pigments added to special “cool” tiles can achieve as much as 25-70 percent reflectivity. Metal roofing containing special pigments can reflect as much as 20-90 percent of radiant heat, depending on the color used. They are also very durable. Any company that offers professional roofing services should be able to advise you on what’s best for your particular climate, aesthetic desires and budget requirements. A “cool” roof is an investment that returns in energy savings and comfort level, plus it’s a green alternative that’s beneficial to the environment. Nicole loves her beautiful little home that she shares with her husband. She enjoys nothing more than spending the weekend drinking lemonade and doing DIY projects around the house.